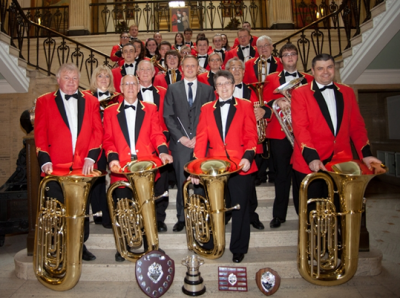 Barnsley Metropolitan Band is a brass band based at The Civic in central Barnsley, South Yorkshire. Rehearsals are on a Wednesday evening 6.45 – 9.00. Enquiries from new players are always welcome. A busy and varied concert schedule sees the band performing at a variety of local, regional and national events throughout the year. The band also organises foreign band tours on a regular basis visiting its friends, Musikzug Deutschherren a Band in Rachtig, Germany. Whilst contesting is not the main focus of the band, it competes annually in the fourth section at the Yorkshire Area Championships. Membership crosses the generations and includes a good mix of ages from 10-60+. There are opportunities for young people to progress through the Junior and Intermediate Bands operating through Barnsley Music Service. Barnsley Metropolitan Band is also a member of Barnsley Music Education Hub, a network of partner organisations providing music education and performance opportunities for the local community.